The Marine Corps has delayed a requirement that all female recruits perform three pull-ups after more than half of them were unable to complete it, raising further questions about the push to integrate women into combat roles and units starting in 2016. The Marines quietly announced the delay in a November report on its TV show, "The Corps Report," and news sources have just begun to report it. An initial memo in 2012 stipulated that female recruits would have to perform three pull-ups like males beginning this year in order to graduate training. Female recruits previously had to complete a "flexed arm hang," or holding their chins above the pull-up bar for at least 15 seconds. They will now have the option of fulfilling either the pull-ups or flexed arm hang requirement for the next annual Physical Fitness Test (PFT). Pull-ups are seen as a test of upper-body strength required to climb over walls, carry ammunition, and perform other tasks common in ground combat situations. While only 1 percent of male recruits failed the pull-ups test at the Marines’ boot camp, 55 percent of females failed it. Critics of the Marines and other service branches’ efforts to include women in thousands of previously all-male combat roles and units say the pull-ups test delay is the first sign of more troubles to come. "A program with a failure rate that high, compared to a 99 percent success rate for men, clearly indicates that incremental plans to order women into the combat arms are not viable," Elaine Donnelly, president of the Center for Military Readiness (CMR) and a former member of the Presidential Commission on the Assignment of Women in the Armed Forces, said in an email. "In [the direct ground combat] environment, which goes beyond being ‘in harm's way,’ lives and mission success often depend on superior physical strength," she said. "There is no reason to force women into the combat arms; for decades, female personnel have been promoted at rates equal to or faster than men." The armed services are currently researching the performance of women in combat training, and female recruits could still be exempted from some positions and units before 2016. Capt. Maureen Krebs, a Marines spokeswoman, said in an email that the delay of the pull-ups test will not necessarily result in the alteration of other requirements or standards. "The delay will allow Training and Education Command time to collect more data to ensure female Marines are provided every opportunity to succeed," she said. Military service chiefs have repeatedly said standards will not be lowered to accommodate women in combat. Army Chief of Staff Gen. Ray Odierno told the Army Times that "this is not about reducing standards" in a recent interview. "This is about setting the standards that are necessary for a specific [military occupational specialty], and we’ll talk of really, three or four: infantry, armor, artillery, and engineers," he said. "And, that’s really where we have most of the closed MOS jobs now." "[The] social engineering part of this is, what’s the best way to initially integrate women into these areas so they can be successful?" he added. Critics argue the integration issue is the most problematic. Research suggests women experience higher rates of injuries and sexual assault in combat situations. The United Kingdom has declined to admit women into infantry positions multiple times due to abnormally high injury rates in training experiments. Donnelly also said the services’ move in recent years toward "gender-normed" training scores could eventually lead to lower standards. Scores on the PFT and Combat Fitness Test (CFT) are gender-normed, meaning women accrue more points than men for the same performances on runs, ammunition can lifts, and other exercises. It is only a matter of time before the Marines and other branches extend gender-norming to infantry combat training courses, Donnelly said. "The presidential commission on which I served in 1992 thought about this long and hard," she said. "We approved of gender-normed scores in basic, pre-commissioning, and entry-level training, but the recommendation was contingent on women's exemption from direct ground combat." "The Obama administration's incremental policies toward co-ed infantry combat have made sensible, gender-specific training practices untenable," she said. "There is no gender-norming on the infantry battlefield." Three female Marines who volunteered for the Infantry Training Battalion (ITB) course at Camp Geiger, N.C., passed it in November, while no female recruits have been able to complete the more rigorous Infantry Officer Course (IOC) at Quantico, Va.
Krebs said the women who passed the Camp Geiger course met the three pull-ups requirement because it was an infantry course. 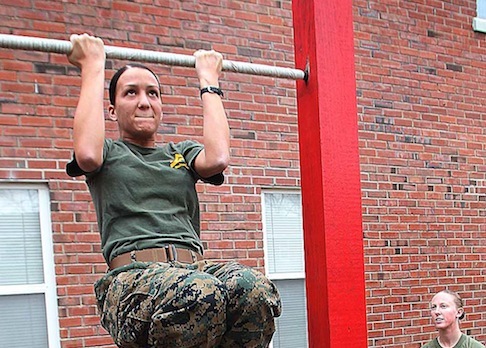 However, they can choose to do either the pull-ups or the flexed arm hang for their official PFT like all other female recruits because that is a Marines-wide standard. Pull-up scores were not gender-normed at Camp Geiger, Krebs said, even though the initial memo with the new pull-up requirement contained a different scoring standard for women compared to men. "While at ITB and IOC, female volunteers are held to the same standards as the males for various evolutions and must meet those requirements in order to pass," she said. Women make up 7 percent of the Marines, compared to 14 percent of Army soldiers. Surveys suggest most female recruits are not interested in combat roles. This entry was posted in National Security and tagged Marines, Military. Bookmark the permalink.